After spending the first half of the year touting frills like Wi-Fi and charging ports on buses, Governor Cuomo finally delivered some news this morning that will make a real difference to transit riders. The MTA plans to buy hundreds of open gangway subway cars, which can carry more passengers and help relieve crowding on maxed-out lines. Later this week, the MTA will release its request for proposals for the construction of 1,025 new subway cars, up to 750 of which will have the open gangway design, as well as an RFP for the redesign and construction of the first three stations of 31 across the city slated for upgrades. Open gangways are accordion-like passageways between cars, which create a nearly seamless space inside the train and yield as much as 10 percent additional capacity. 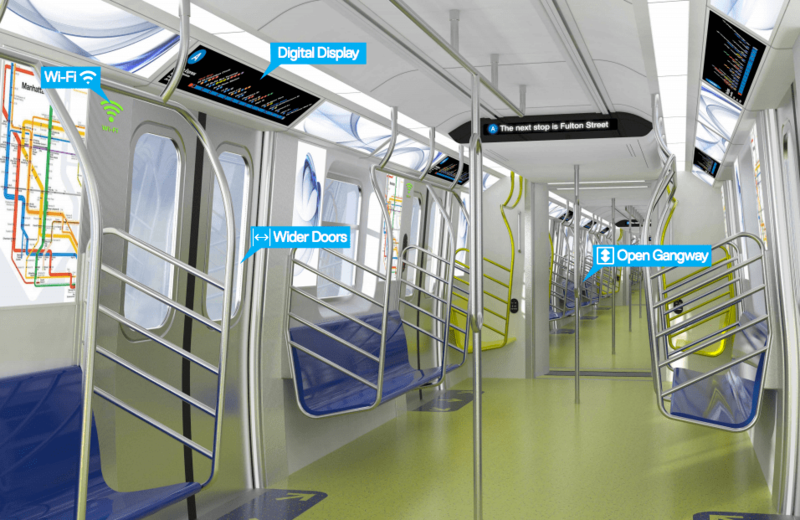 The train design unveiled this morning also calls for 58-inch-wide doors, which the MTA said will speed boarding 32 percent compared to the current 50-inch design. Both design changes should improve reliability by reducing crowding-related delays, which the MTA says account for a substantial share of all subway delays. Previously, the MTA had said that it would only try out 10 open gangway cars in its next train purchase. A purchase of 750 cars is a vast improvement and should make a noticeable difference on crowded lines, though the MTA has yet to announce where the new cars will be deployed. It also bodes well for future purchases as the MTA refreshes its 6,400-car subway fleet. While 31 percent of subway cars in London and 56 percent in Toronto have open gangways, no transit system in the United States has implemented the design, according to the governor’s press release. 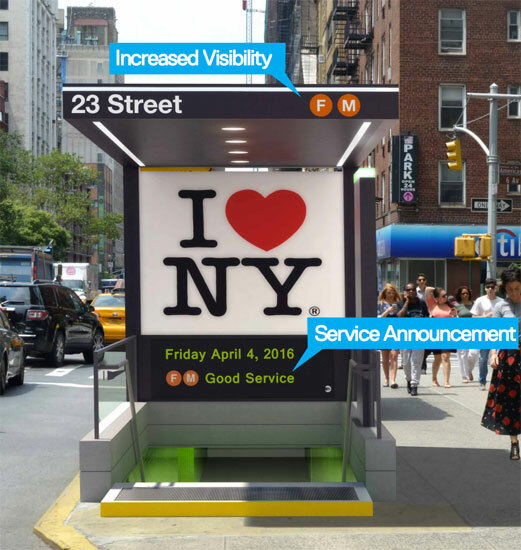 A rendering the new features coming to 31 subway stations in the coming years. 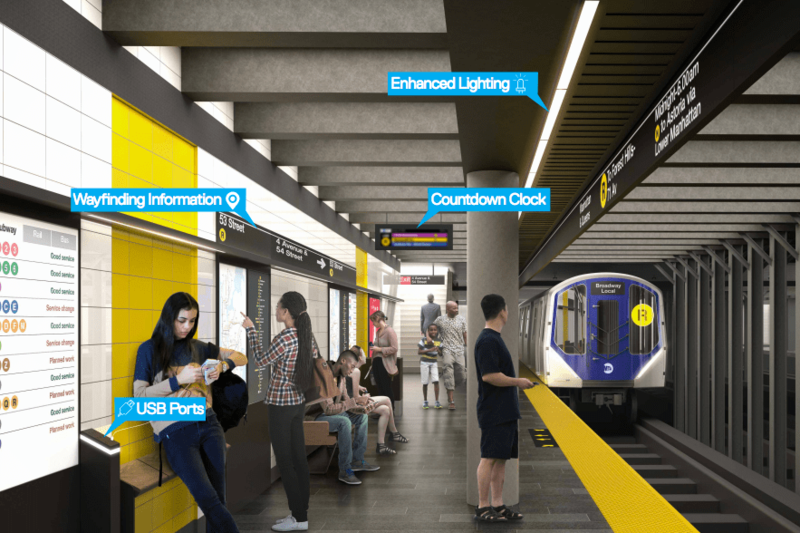 The MTA will also release an RFP this week for three station redesigns that will include above-ground service announcements, enhanced lighting, and new countdown clocks. The three stations are all in Brooklyn: Prospect Avenue, 53rd Street, and Bay Ridge Avenue. The same upgrades are slated for 28 additional stations in the MTA’s five-year capital program. Neither the governor nor MTA officials gave a timeline for putting the open gangway cars into operation, though the agency said in January that it expected its new batch of trains to start service in 2020. Displays at station entrances would show service status to people at street level. Rotate the entrances 180 degrees. Ahh. That would put the entrances towards the entrance. I’m sure you know that not every subway entrance is the same. Flipping entrances would require a reconfiguration of the underground passageway. I still think bollards suffice for entrances like this. You’re right. I thought we were looking north on 6th Avenue at 23rd Street, where the current entrances are oriented east-west, and thought this was suggesting moving them to the other part of the corner. But we’re actually looking west on 23rd. Governor Cuomo wants to cut $65 million from the state's annual contribution to the MTA. An analysis by the Riders Alliance and Regional Plan Association identifies transit improvements that money could pay for. The subways remain vulnerable to routine weather events setting off enormous disruptions, while the governor touts bells and whistles like underground internet connectivity.